Caffeine Free vs Decaffeinated: What’s the Difference? Caffeine free and decaffeinated mean two totally different things, yet many Americans use the words interchangeably. Here is what you should know, especially if you are trying to limit or minimize caffeine in your diet. 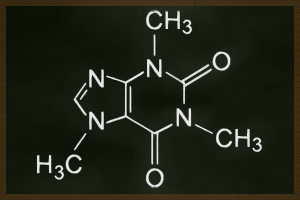 Caffeine free means that all ingredients occur in nature without caffeine. Therefore, there is no special process to remove the caffeine from them. Real tea is never caffeine free. Other plants, like rooibos, honeybush or chamomile which are common in herbal tea are caffeine free. If you are looking for a 100% caffeine free drink, you need to use the term caffeine free and not decaffeinated. Tisanes and herbals are caffeine free and get to count toward your water consumption since there is zero caffeine in the final brew. Decaffeinated teas do not. Decaffeinated means that the product has undergone a special process to strip most, but not all, of the caffeine out of it. CO2 decaffeination is commonly used in the tea industry to remove caffeine from tea leaves. To read in depth about this process, take a look at this blog post. The decaffeination process, however, still leaves residual caffeine. In both the United States and Europe, there is not set amount of residual caffeine, but a percentage of the original caffeine of the batch that is allowed. Given that the original amount of caffeine can vary dramatically between teas and even harvests of the same tea, there is no exact way to find the amount of caffeine remaining. Quite frankly decaffeinated teas do not and cannot taste as good as the original tea. While the caffeine is being removed, other polyphenols are also being removed that provide the original flavor to the tea. This normally leaves the decaffeinated tea tasting flat, so for many people, tisanes and herbal teas are more appealing when avoiding caffeine. These differences between decaf and caffeine free make a huge difference in your tea drinking experience. Use them wisely. It is easy to add home grown herbs to your favorite tea. With all the work that goes into maintaining a garden, your herbs can be enjoyed in your beverages as well as food. Here are 3 tips on how to make this the best tea experience possible. 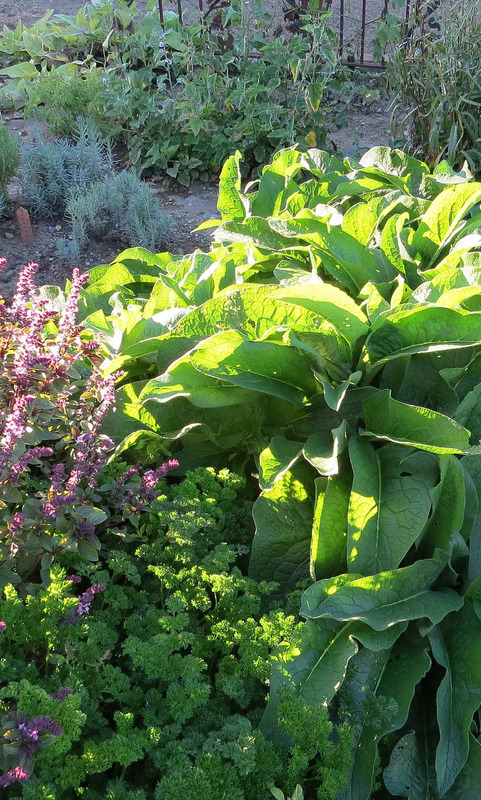 Pesticides/Fertilizers – Be careful with how you fertilize and protect your herbs. Even if you don’t use a liquid fertilizer or pesticide in your herb garden, if they are used in your yard, transfer can happen with the wind, animals or you. Obviously, rinse your herbs before drying or consuming. Nobody wants fertilizer or pesticide in their cup of tea. Dry vs. Fresh – The herbs can be added both ways. You should blend by the cup, meaning pick and add when you are ready to consume. This is because you need to be super careful with storage. Fresh herbs should generally not be stored with your dry tea. The moisture will be quickly absorbed into the tea. Mold can easily grow if it occurs in your dark, airtight container (which is how you should be storing your tea). If you are drying your herbs, you can mix a batch with your tea and store it for later consumption. Just be absolutely certain they have been thoroughly dried. Any moisture in those herbs will find its way to the tea and may cause mold in your mix. You can have too much of a good thing – Herbs have beautiful smell and flavor and can quickly overpower your tea. So think of a flavor profile for your tea before you mix. You should also realize it won’t take much herbs to flavor your favorite tea. If you are wondering the ratio to use, with a few exceptions, anything over 10% will over power your tea and generally 5% does the trick. So have fun playing with your home grown herbs. You will be amazed at which ones compliment tea well. Flowers have been added to tea for centuries. How many of the 5 of the most common flower petals do you recognize from your favorite tea blends? Calendula – This golden yellow petal is a member of the marigold family. It has been used for centuries in food as the petals are edible. They were originally used to dye cheese and other food items a creamy yellow. It also acts as a replacement for saffron. Brewed by itself, this petal has a very leathery flavor. However, added to tea, it smooths out the astringency of drink. We use it to soften the tea flavor in our Georgia’s Peach. Cornflower – The cornflower is a member of the Asteraceae family. Commonly used as a decorating plant in flower beds, this pale to dark blue flower has been long prized for its color. The petals are edible and are easily used to dress up any food item. The color in the petals transfers out in hot water, which will affect the color of the tea brew. We love how this looks in our Shenandoah Blue. 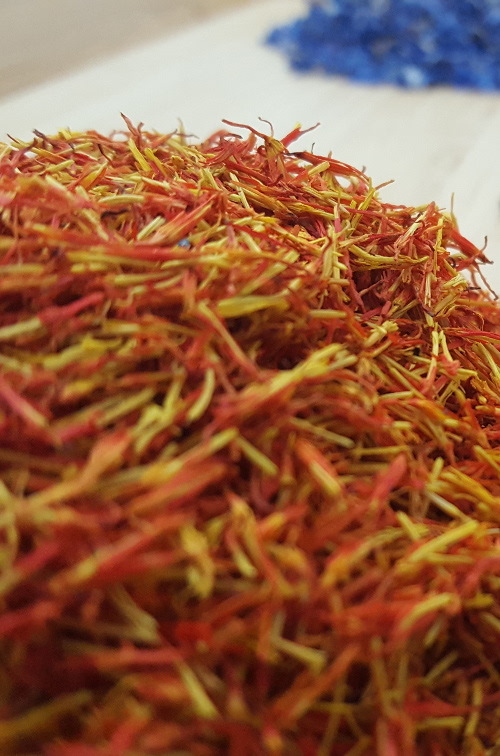 Safflower – This red or yellow flower is also a member of the Asteraceae family. This plant has been used by humans for centuries. Its seeds are where safflower oil comes from and its petals have been used for dyes. For tea, they are used to dress up the dry leaf by adding some visual interest. You won’t be missing this flower in our Cherry Blossom White. Jasmine – First used by Chinese to scent tea, this famous night blooming flower is known more for its scent than its petals. It is pale white and quite fragile, which helps to explain why the petals do not appear as often in tea blends as you might think. The other reason they don’t appear often in tea blends is that when brewed they impart an unsalted steamed green bean flavor, not the scent imparted by the pollen of the flower. Rose – This famous flower has thousands of cultivars and not all of them are safe for culinary uses. The Food & Drug Administration allows only the use of certain species in food, which are Rosa alba L., Rosa centifolia L., Rosa damascena Mill., Rosa gallica L., and varietals of these species. These beautiful petals add both scent and a slight astringency to the tea they are added to. We give them a starring role in The Rose Garden tea. The next time you are exploring tea blends be sure to look at the ingredients and see if you recognize any of these flowers. The Fujian Province of China is an ecologically diverse region of China that makes the perfect home for tea to grow. Located on the southeastern coast of China, Fujian is approximately 46,000 square miles, about the same size as Mississippi. It currently has a population of 38 million, 1 million higher than the state of California (the most populated state in the US). Fujian is home to many Chinese ethnic minorities including the Hui, Miao and Manchu to name just a few. The Silk Road turned Fujian into one of the most culturally diverse regions of China and the mountainous topography allowed the different cultures to settle and remain distinct over the centuries of migration through this area. This amazing mix of diversity in both people and land forms has created a region with diverse tea production and culture. Fujian has a humid and mild climate, even up in its mountains. The average low temperature is 41°F and the high will get to around 85°F and averages around 40 inches of rain a year. Most of the tea in the Fujian province is grown in the mountains. Mount Wuyi is the most famous mountain in Fujian province and is part of a jagged mountain range that is a UNESCO World Heritage site. Most of the tea are planted on the eastern and northern slopes of this range to get the right mix of fog and sun. The mild climate also makes this province home to a wide variety of fruits and flowers like bananas, lychee, olives, and jasmine. There is a saying in China that says if you travel 5 kilometers (3.1 miles) in Fujian, the culture changes, and if you travel 10 kilometers (6.21 miles) the language changes. This cultural diversity is attributed to the Silk Road, that travels through the entire province. 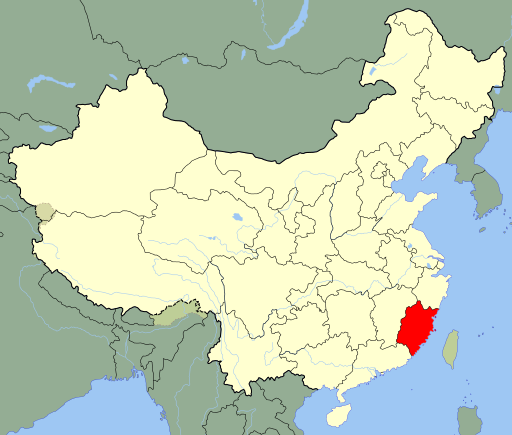 Fujian is one of the oldest provinces, established during the first emperor of the Qin Dynasty (220BCE-206BCE) that has survived many dynasties intact. Its large coast lines created even larger trading ports along the coast and the Silk Road created large trading cities inland and brought in many different cultures. To give you just a glimpse into the cultural diversity, the Hui are decedents of Arabic and Persian merchants and are one of the largest Muslim communities in China. Their dialect is a mix of Chinese and Persian. The Manchus are descendants of the Jurchen people, who were farming tribes in northern China and Siberia that came south bringing their farming and animal husbandry skills to the rest of China, including goat and cow milk production. While the traditions and dialects are different, generally all the cuisines focus on the the abundant seafood found on the coast along with the wide varieties of fruit and vegetable that grow in the region. The spicing on the dishes reflect the culture and heritage of the chef that produces them. Fujian Province is considered the birthplace of Jasmine Dragon Tears Tea, with its creation beginning during the Song dynasty (960 CE-1127CE). It is from Fujian that we get the pine smoked Lapsang Souchong, and where we can find great oolongs like Ti Kuan Yin as well assubtle black teas like Da Hong Pao. The tea culture has been here since its beginning and has been influenced by the Silk Road. The oolong technique started here traveled the short distance across the Taiwan straight to Taiwan. 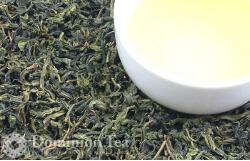 The techniques for Jasmine tea traveled to other provinces like Huebi. For tea drinkers, Fujian is an important part of tea history and still plays a key role in the industry today. Bao Zhong Oolong leaf and infused liquor. Bao Zhong Oolong is a light creamy oolong that belongs to a group of oolongs called pouchong oolongs, or green oolongs. These oolongs are lightly oxidized, around 20%, which is typical of a green tea. However they are characterized as oolongs due to the steps taken in their manufacturing process and their sharper more melon like flavors. The name Pouchong translates to “paper wrapped” tea. A reference to the older manufacturing process of wrapping the tea in paper as part of the drying process. As technology advanced to allow for more consistent ovens that better controlled the temperatures during the baking process to stop oxidation, this practice has stopped. 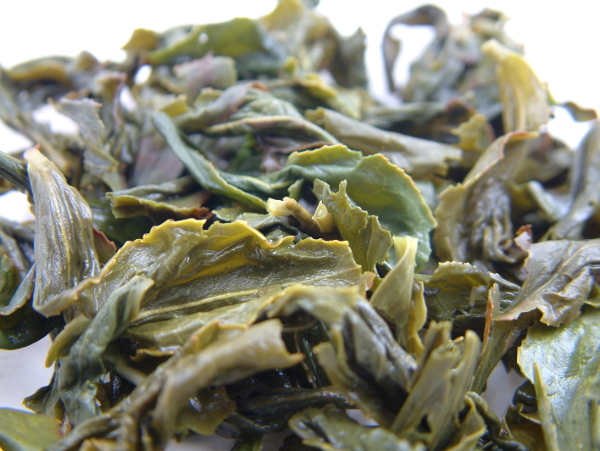 Bao Zhong Oolong is now produced mainly in the northern part of Taiwan. However, you can periodically find Bao Zhongs from the Fujian province of China. Pouchong oolongs where produced in mainland China for many centuries, but fell out of favor during the 1800’s. Taiwan at that time was looking to distinguish its tea manufacturing from China and adopted the practice of Pouchong teas, which it still keeps today. Bao Zhong is produced in the Wen Shan mountains of Taiwan about 30 miles south of the capital city of Taipei. The terroir of the region is high mountain with ocean mist and fog blanketing the mountains most mornings and burning off later in the day. This gives the the right amount of moisture and sun, allowing for the perfectly subtle and yet complex flavors that are expected from this tea. This oolong is hand twisted as opposed to being balled like Ti Kuan Yin. The minimal handling and light oxidation of this oolong creates a light, creamy oolong that is closer to a green tea than most other oolongs. Like other oolongs, you are going to use a lower water temperature. 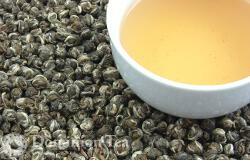 However, because of its green tea characteristics, the water temperature can be dropped even lower to 175°F. You can use 3 grams to 8 ounces of water and keep your steeping times between 2-3 minutes. If you happen to own a Gaiywan, and enjoy this way of consuming tea, this is a perfect tea to steep in it as it does contain smaller particulates that will come out of the twisted leaves when brewed that give it a full mouth feel when consumed in the water. Bao Zhong oolong should sit on every tea drinker’s list as a tea you must try at least once to consider yourself a true tea connoisseur.